September 28, 2016 — As I walked around Waukegan, Illinois, I was looking for one thing, er, person…Ray Bradbury. The author was born in that Lake Michigan town, spent much of his adolescence there, and used it in his stories often. I’ve already told you what I found there—traces of his past life, the tributes to his current legacy. But the one thing I didn’t find was a statue of him. I mean, there was one of comedian Jack Benny, another Waukeganite, but not one of Ray Bradbury. And that’s because I was in town too early. The city’s been working on a statue project for him for about a year and half and, by the time of my visit, had narrowed the 40-odd submissions it had received to three. In fact, mere days after I returned from my trip to Waukegan and other points along the shores of the Great Lakes, the city announced the winning design. I haven’t been this excited about a statue since Boston proposed its Edgar Allan Poe statue in January 2012. When that one happened, it inspired this little write-up that was, honestly, pretty out of character for the OTIS blog. Normally, I’d post a news link and move on. For some reason I didn’t that time. And little did I know that by the time the statue was finally installed in October 2014, I’d have an entire book out on the guy, part of which was tracking the creation of this statue through interviews and events. That’s not to say I’ll ever get a Bradbury book out of my system, but I do love me some statues of my heroes. 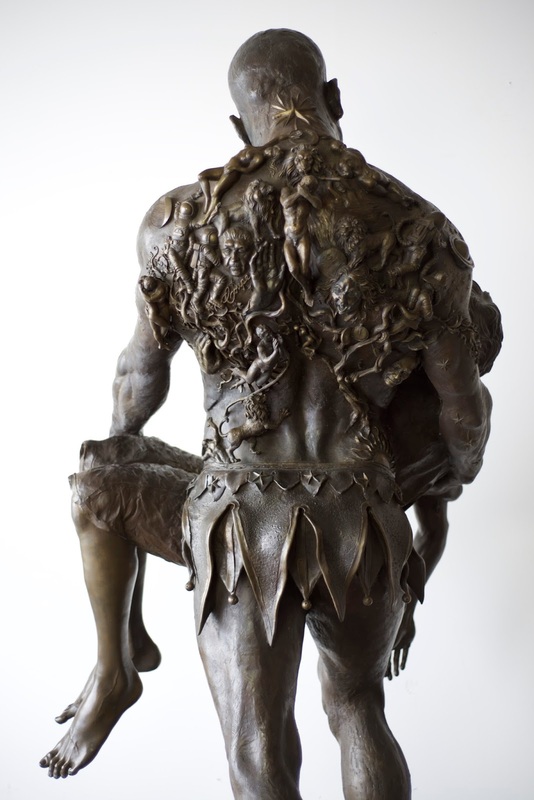 It was Virginia-born artist Zachary Oxman who won the right to make a metal Bradbury. These days, Oxman lives and works in Maryland, my old stomping state. He envisions depicting Bradbury in his 20s/30s (judging that solely by the maquette in the photo), straddling a clockwork rocket ship like he’s Slim Pickens on a nuke. In his hand, thrown back like a cocked whip, is a book, it’s pages flying almost like Bradbury is preaching from it. 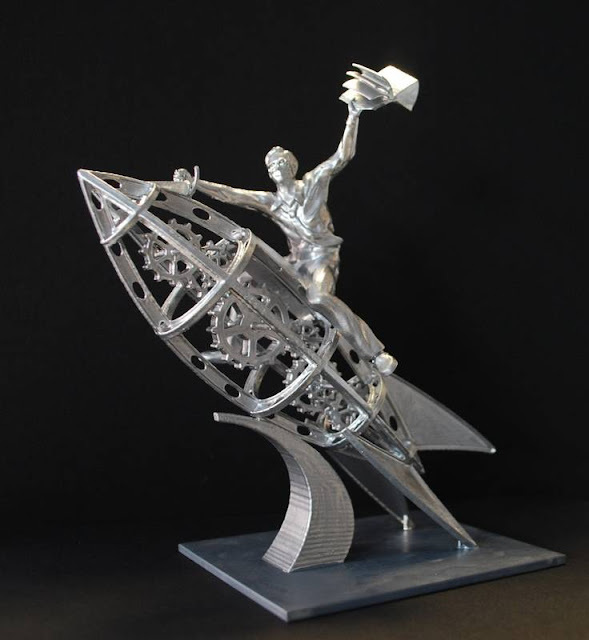 The statue will be 12 feet tall, made of between two and four tons of stainless steel, and placed near Waukegan’s public library, to which Bradbury willed his book collection. The design is called, Ray Bradbury: Fantastical Traveler. I like it. Although I shouldn’t. Mainstream attention on Ray Bradbury focuses on his two most popular works: Fahrenheit 451 and The Martian Chronicles. So he’s often called a science fiction writer. I always balk at that. Partly for the reasons that Bradbury himself balked at the moniker, because he considered himself a fantasist. But also because the works that drew me personally to him weren’t anywhere near science fiction. I mean, I like his future fantasies, but I like them like I like Aldous Huxley and George Orwell’s, awe without passion. Although that phrase only applies to the subject matter and not his ability with the language, which I am always passionate about. The works that drew me were his darker, autumn-tinted works—Something Wicked This Way Comes, The October People, The Halloween Tree, From the Dust Returned, Dandelion Wine (ok, so that last doesn’t thematically belong in this list, but it’s one of my favorites—and it does have a serial killer). 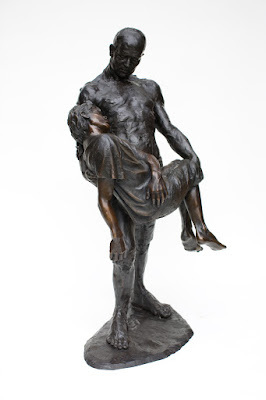 That’s one of the reasons why I liked Christopher Slatoff’s 2015 Bradbury statue so much. It was dark and strange and would look perfect with a smashed pumpkin at its base. It depicts the titular character of Bradbury’s The Illustrated Man, conflating it with the possibly apocryphal story of Bradbury’s childhood encounter with a carnival performer named Mr. Electrico that inspired him to start writing. But other than Oxman’s statue having not so much as a single autumn leaf on it, he manages to avoid pigeonholing Bradbury with the rocket. It acknowledges Bradbury’s space obsession and the impact on culture of those works, but by making it a hull-less clockwork ship, places it in the context that the author himself did: Bradbury’s rocket ship is for the mind, not the body. He was never playing with science in his science fiction, he was playing with the imagination. And then Oxman places Bradbury on top of it like a cowboy, further heightening that effect. But where Oxman’s statue really nails Bradbury in a way that Slatoff admittedly misses (although he did work with Bradbury himself on its design), is the utter ecstasy of the author. Ray Bradbury is a joyous writer, both in what he says about the act of writing and what’s on the actual pages of his book. Even at their darkest, his books are filled with delight. And Oxman’s depiction of Bradbury riding the rocket illustrates that. It even encompasses one of the important balancing points of a Bradbury statue in Waukegan. Bradbury didn’t live in Waukegan as an adult, but the statue obviously needs to be of an adult Bradbury. With Oxman’s design, the ever-kindled boy inside the author is easily apparent. Right now, they’re (very) slowly raising the $125,000 needed for the project, so that plus the usual red tape for such an effort means it’ll be years before we see Ray gleaming above his hometown. So good job, Zachary Oxman. And Waukegan. I’ll come back when it’s up. Even if I would have rather it depict him climbing up a Halloween Tree.